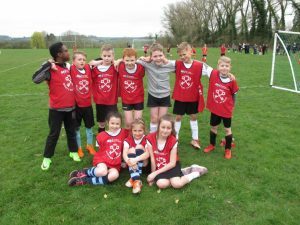 Well done to our year 3 and 4 footballers: We played in a 5-a side tournament on Thursday 21st March at King Alfred’s School in Wantage. There were 8 teams taking part from different schools. Our team of 3 girls and 7 boys played amazingly well. We won 2 out of 3 of our matches, scored lots of goals, did some incredible passing, tackling and goalkeeping; then got through to the semi-final which we won! We played Sunningwell School in the final; it was a very close game which we narrowly lost 1-0. As we came second, we can now go through to the Vale County tournament.